If you are planning to grab a new iPhone, and want to get one in EMI Vodafone has some great deals for you. If you are planning to grab your first iPhone, but a little short on money, don’t worry. Now, Vodafone has introduced EMI options on iPhones, and being one of the carriers of the country, they can get some pretty good response. 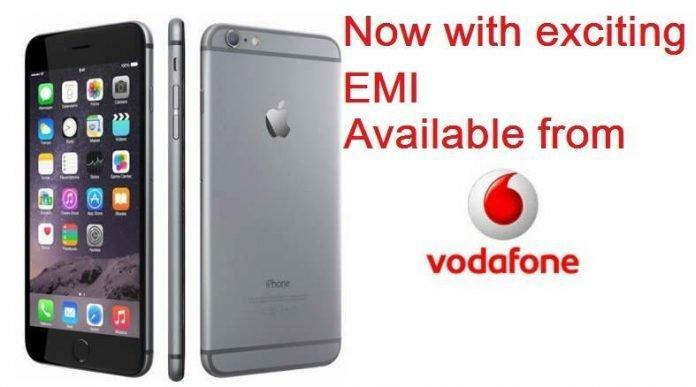 If you are new to the Apple ecosystem do not want to spend much, you can stat with iPhone 4S, as Vodafone will offer EMI options including iPhone 4S, 5C, 5S and the latest iPhone 6 and & Plus. The EMI options starts at Rs. 2099 for iPhone 4s, Rs. 2499 and Rs. 2999 for iPhone 5c & 5s and Rs. 3599 for iPhone 6 & 6 Plus. The EMI will also cover a lot of benefits for 2 years, and the customers will get lots free minutes (local/STD), SMS and data to ensure that they do not need to pay extra after they buy the phone or they need to spend very little afterwards. For that, there are two plans- iPhone 6K and iPhone 10K. This is not the end, You can also avail an introductory cash back offer of Rs. 3000 on all models of iPhone 6 Plus and iPhone 5s. Offer also available with a 12 month EMI option or upfront cash payment.